In 1670, two sky watchers independently noticed the appearance of a new star, or nova, in the constellation Cygnus. It first appeared as a bright point of light that faded, reappeared and then vanished from view. Now known as CK Vulpeculae, the remnants of the first reliably documented nova appear as two fans of debris arcing away from a compact central body in the shape of an hourglass. 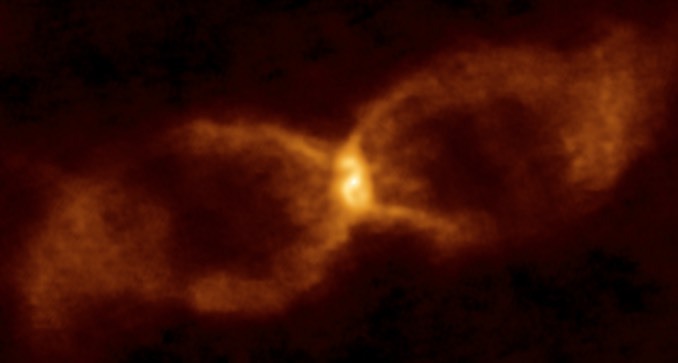 Researchers studying CK Vulpeculae initially thought the apparent nova was the result of two main sequence stars crashing together. 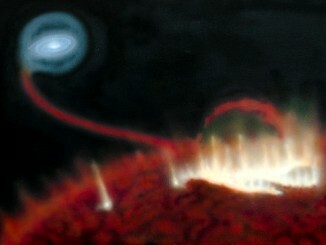 But new observations with the Atacama Large Millimetre/submillimetre Array, or ALMA, indicate it was the result of a collision between a white dwarf, the cooling core of a burned out star, and a brown dwarf, a so-called “failed” star without enough mass to sustain nuclear fusion. 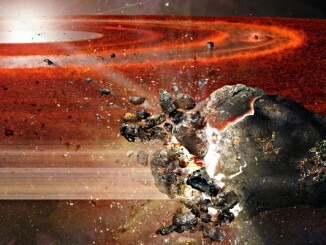 “It now seems what was observed centuries ago was not what we would today describe as a classic ‘nova,'” said Sumner Starrfield, an Arizona State University astronomer and co-author on a paper in the Monthly Notices of the Royal Astronomical Society. The much smaller white dwarf likely was 10 times more massive than the brown dwarf. As the brown dwarf spiralled inward in the grip of the white dwarf’s gravity, it would have been torn apart by extreme tidal forces. 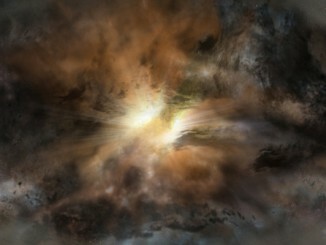 By studying starlight passing through the clouds of gas left over from the collision, researchers have detected lithium, which is easily destroyed in main sequence stars. Formaldehyde and other organic compounds are also present in the hourglass-shaped clouds, molecules that would not be present in a star undergoing nuclear fusion. ALMA observations of the dusty protoplanetary disc surrounding a star known as HD 107146 provides evidence for an entire family of orbiting Pluto-size objects, a solar system in transition from early life to maturity where planets have finished forming.